Isn't it time for a world leader that's openly bipartisan? We know what you're thinking, because we thought it, too. Frankly, people ask this question all the time. But when you really stop to think about it, the answer is clear. Vote for Misha Collins because you can. Nobody can tell you how to cast your ballot! You have the freedom to choose, so why not choose to elect the obvious best man for the job? 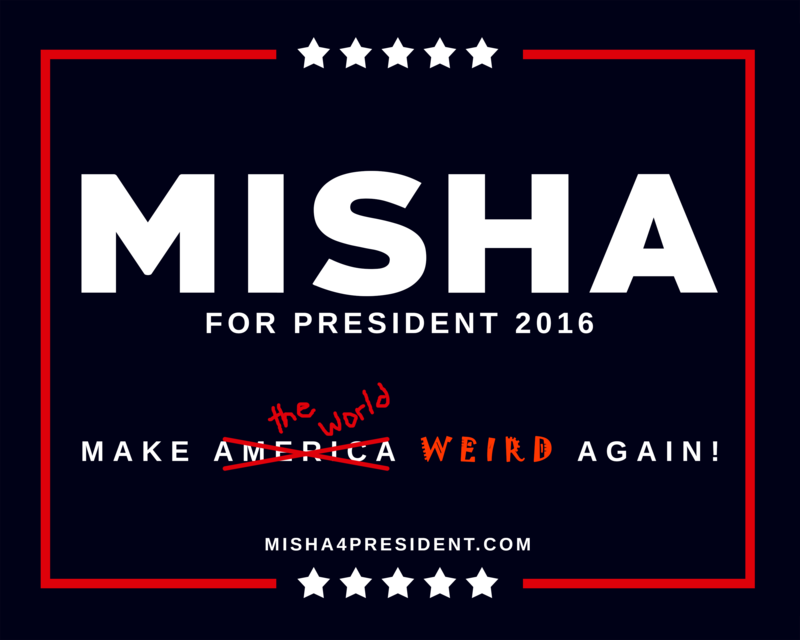 Vote Misha! Misha Collins is the only candidate with the balls to run as a bipartisan candidate, throwing his hat into the ring as both a Democrat and a Republican. But future Commander-in-Chief Misha Collins isn't content with just being "bipartisan." He's also the world's first "try-partisan" candidate— meaning there's almost no party he won't try to get into bed with to win the Presidency*. In addition to Democrat and Republican, Misha is also running as an Independent, a Green Party candidate, a Peace & Freedom party candidate, and a Libertarian. In fact, Future President Collins is committed to being involved in as many parties as possible, as long as they're not being held at his house so he doesn't have to clean up the mess. *Seriously. Got pull with the Electoral College? For a good time, call (323) 790-4967. 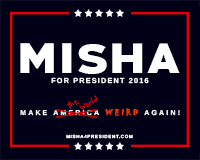 Misha Collins is a candidate that doesn't believe in limits and is willing to do pretty much anything in his desperate grab for power. But no one ever rises to the level of "serious presidential contender" without engaging in a little blatant hypocrisy. 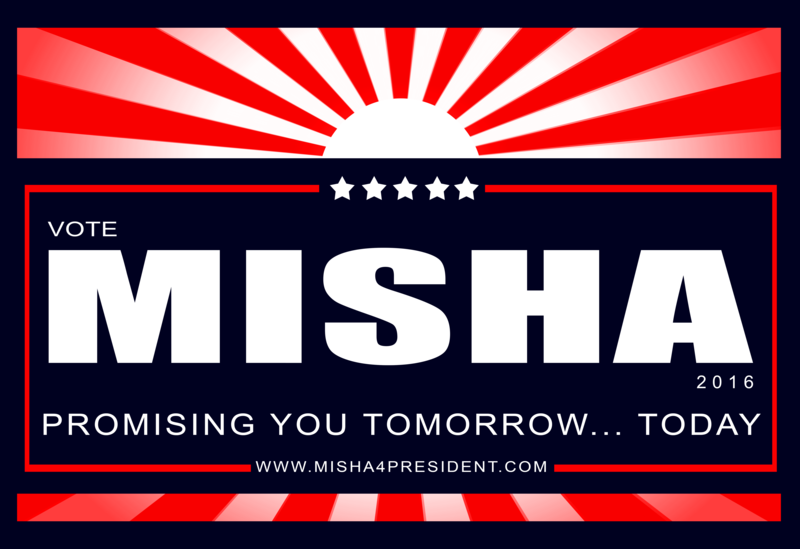 With that in mind, Misha Collins is not running as a candidate for the Prohibition party, The American Freedom party, or any party that doesn't have at least one piñata or a pony— because nobody needs that kind of negativity in their life. As your new global leader, you can count on President Collins to always bring the party— no matter which party you support. After all, if you're going to cast a ballot for a megalomaniacal narcissist anyway, why not choose the one that will make the next four years fun? Your Vote Counts... So make a Difference. *Of the United States... Or just embrace the inevitable and elect him President of the Universe. **This site is not actually accepting "campaign" contributions. We encourage you to instead donate to Random Acts if you really want to make a difference in this world. Proudly display your support with these printable campaign signs! This site does not constitute Random Acts' involvement in nor endorsement of any political campaign, candidate, or position.